An issue in the current push for reform in mathematics education is the call to address statistics at the precollege level. This volume represents the emerging findings of an interdisciplinary collaboration among a group of mathematics educators, cognitive scientists, teachers, and statisticians to construct an understanding of how to introduce statistics education and assessment for students in elementary and secondary schools. 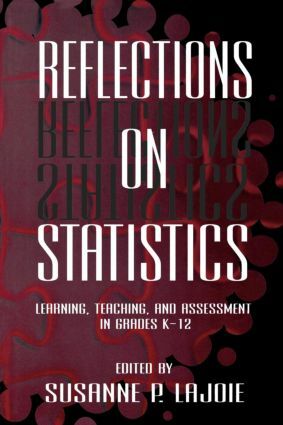 A premise shared by the contributors to this volume is that when students are introduced to statistics at the K-12 level and provided with opportunities to do statistics that are related to actual life situations, they will be better prepared for decision making in the real world. The interdisciplinary nature of the group of researchers stimulated a lively interchange of ideas for enhancing the learning, teaching, and assessment of statistical understanding, which is reflected in this volume. Mathematics educators contribute their insights into how teachers teach mathematical ideas and heighten our awareness of the ecological needs of the current mathematics classroom. Cognitive scientists share their understanding of developmental differences in learning and present theoretical perspectives that contribute to the design of effective learning environments. Classroom teachers share their ideas about classroom activities and assessment of student learning, as well as their concerns for in-service training and workshops to help teachers acquire skills in this new content area. Statisticians offer their understanding of what is feasible to teach in the early grades, and what their view is of statistical literacy. * look at teacher education for statistics instruction in grades K-12. This is a must-read book for both practitioners and researchers involved in K-12 mathematics education. "This volume represents the emerging findings of an interdisciplinary collaboration among a group of mathematics educators, cognitive scientists, teachers, and statisticians to introduce satistics education and assessment for students in primary and secondary schools." "I highly recommend the book to teachers who would like to ground their lessons in the sort of mathematical investigations that were undertaken throughout history. The book is useful for teachers looking for enrichment exercises or good exposition on the historical development of a topic under study." "The writing is clear, and graphs, tables and charts are provided in abundance to support the text. The classrooms used in the studies indicated a mix relative to gender and race, and one reviewer stated that the research questions did not seem biased in any way." Contents: Preface. S.P. Lajoie, T.A. Romberg, Identifying an Agenda for Statistics Instruction and Assessment in Grades K-12. Part I: Statistical Content. R.L. Scheaffer, A.E. Watkins, J.M. Landwehr, What Every High School Graduate Should Know About Statistics. G. Burrill, T. Romberg, Statistics and Probability for the Middle Grades: Examples From Mathematics in Context. Part II: Teaching Statistics. G.W. Bright, S.N. Friel, Graphical Representations: Helping Students Interpret Data. S.N. Friel, G.W. Bright, Teach-Stat: A Model for Professional Development in Data Analysis and Statistics for Teachers K-6. Part III: Learning Statistics. J. Horvath, R. Lehrer, A Model-Based Perspective on the Development of Children's Understanding of Chance and Uncertainty. K.E. Metz, Emergent Ideas of Chance and Probability in Primary Grade Children. S.J. Derry, J. Levin, H. Osana, M. Jones, Statistical Gaming. Part IV: Assessing Statistics. S.P. Lajoie, N. Lavigne, S. Munsie, T. Wilkie, Monitoring Student Progress in Statistics. D.L. Schwartz, S.R. Goldman, N.J. Vye, B.J. Barron, the Cognition and Technology Group at Vanderbilt, Using Anchored Instruction to Align Everyday and Mathematical Reasoning: The Case of Sampling Assumptions. I. Gal, Assessing Statistical Knowledge as It Relates to Students' Interpretations of Data. Part V: Epilogue. S.P. Lajoie, Reflections on a Statistics Agenda for K-12.